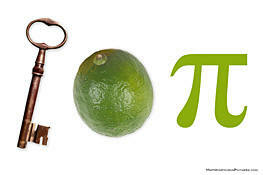 To get fresh key lime pi, everyone knows to go to Key West! While "marching to the beat of a different drum" in a historic cemetery in Key West, you might notice some key lime colored grave markers nearby. Just who DISEL, MATT GRIMES, and BINK are is for you to decide. If, however, you look to the top of the short iron fence to the right of BINK, you should spot a nice little niche in the large tree. You'll find key lime pi preserved under a small rock in the hole.